This is my best buddy Dan. 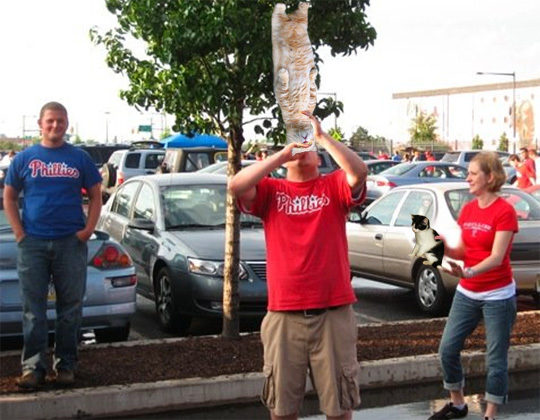 He is playing the traditional Philadelphia Tailgate sport of DizzyBoozecat Bat. You balance the cat on your chin for as long as you can. You then spin in a circle around the cat . . . . never mind. This doesn't make any sense. The drinking game doesn't translate well to the Boozecat world. If you are really interested just e-mail me. Or ask my other best buddy and frequent commenter, Weimert. He broke his collarbone playing this during a game last season. Impressively he made it until the 7th inning before the pain was too much to handle and we went to a hospital. Haha I am pretty sure the DizzyBoozecat Bat didn’t like the way I was holding it and knocked me over….